ESPN3 has been rendered mostly useless by ESPN’s decision last fall to use ESPN3 as mainly a place for “exclusive” content (which usually means sports or games not popular enough to be on ESPN or ESPN2). 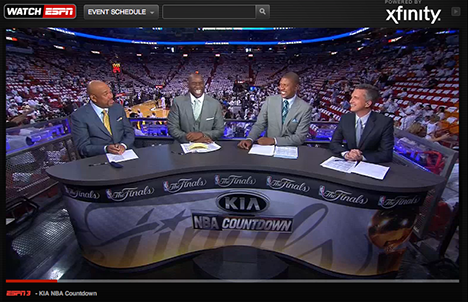 However, they have used ESPN3 as the online home of the NBA Finals which is broadcast on ABC. You’ll still need to be able to get ESPN3 through your ISP to watch the game online and you’ll need to actually have an TV subscription to ESPN through a participating TV provider to watch via mobile. Download the WatchESPN app for iPhone or iPad from the App Store, or Android version from Google Play or Amazon.com.